Study the basic functioning of light seeking neuron circuits. mainly for the differentiation of sensory receptor cells and effector cells. Biological neural circuits (neural pathway neurons) are organized into ensembles (cultured neurons) or circuits, which process specific kinds of information’s. Neural circuits are varied according to their intended function and features that are characteristic to such ensembles. The synaptic connections between neurons forms a circuit which consists of dense tangle of dendrites, axon terminals, and glial cell processes that together constitute a neurophill. Neurophill is the region between the nerve cell bodies where the synaptic connectivity occurs. The direction of information flow is essential to understand the functions of each neural circuit. Nerve cells that participate only in the local aspects of a circuit are called interneurons or local neuron networks. There are three different classes of such circuits. They are afferent neurons, efferent neurons, and interneurons. These are the basic constituents of all neural circuits. Neural circuits are both anatomical and functional entities. These are the neurons which carries informations towards the brain and spinal cord from the sensory organs. When a sensory stimulus (light or smell) activates the receptors, it generates the signals which is carried to the brain through the afferent neurons and produces a corresponding reflex action. These are the neurons which transfer informations from the brain to the sensory organs. That is, when afferent neuron brings the signal to the brain, it activates and produces motor signal which is carried by the efferent neurons to the organs and cause the reflex actions. These are the most abundant type of neurons in our body. Both the afferent neurons and efferent neurons use the interneurons for transferring signals. For example, when our hand skin is sensitized by heat, the afferent neurons located in our skin uses interneurons to transfer the signal to the brain. This signal is processed and efferent neurons carry the information from the brain by connecting through interneurons and produce a reflex action of sudden withdrawing of hand from the heat. Thus both afferent neurons and efferent neurons are connected through interneurons. Artificial neural networks are usually known as neural networks (NN). Artificial neural networks are designed on the basis of biological neuron networks. It is a computational system inspired by the Structure, Processing method and learning ability of a biological brain. It consists of a group of artificial neurons or simply artificial nodes that are interconnected in different layers of the system. When a specific stimulus activates these artificial neurons, activation is followed by the production of numerical outputs. Artificial neural circuits mostly explain the neural network models employed in artificial intelligence, information processing, statistics, cognitive psychology etc.The advantages of artificial neural network models are massive parallelism, distributed representation, learning ability, generalization ability, fault tolerance etc. Thus it is mostly used to model complex relationships between inputs and outputs or to find patterns in data. This neural network system allows only the transmission of signals in one direction, i.e. from input to output. It is mainly applied for the pattern recognition of data. In this type of neural network system, the transmission of signals occurs in both directions. These systems are more complicated and are dynamic in nature. It is because their states changes continuously until they reach equilibrium point. In this type of neural network models, units are arranged in a layered feed-forward topology. Here, the units perform a biased weight sum of their inputs and pass the activation level through a transfer function to produce their outputs. This is the most popular neural network model that used for computational modeling of data. In this section, we address a specific subject in biophysics neuronal network. (For the basic functioning of neurons refer Neurophysiology Virtual Lab.) It may be vital that those exercises be refreshed before trying to implement an analog neuronal bot circuit (bot is a tech term to refer to robots, especially small robots such as the one described here). In other experiments, we have seen analog neurons and its properties. Here we are describing about light seeking nature of analog neural network using simple electronic components. Here a differentiating circuit is used as a neuron. (Fig 2) An Nv neuron is designed using a capacitor, resistor, and inverter. In this case, an integrating circuit element is used as a neuron (Fig 3).This kind of neuron is designed using a capacitor, resistor, and inverter. Nu neurons is sometimes called neural neurons. A network of Nv neurons is called Nervous networks. ( The original concept was patented by Mark Tilden under the acronym VSPANS). Non-branched Nv nets are often described as cores , these cores may differ according to the number of Nv neurons present .They are usually referred as Bicore ,Tricore, Quadcore ,Quincore, Hexcore, Septcore, Octacore, etc. It is loop-topology network with two Nv neurons .This kind of connection forms an oscillator. Bicore can be either grounded bicores (Fig 4) or suspended bicores (Fig 5). A loosely-coupled pair of bicores is known as monocore , rather than being coupled in two places it is coupled in just one place. We use Nv neuron with Light dependent resistor (LDR). It is accomplished by sporadic differential firing of two small motors which moves either toward or away from the brightest available light source .LDRs or Light Dependent Resistors are very useful especially in light/dark sensor circuits. 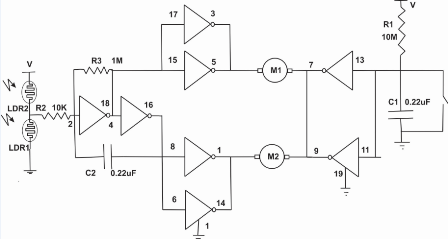 Normally the resistance of an LDR is very high, sometimes as high as 1000000 ohms, but when they are illuminated with light resistance drops dramatically.Then more current flows through it. The schematic representation of the above figure ( Fig 6) is a simple light seeking neuron circuit using 74HC240 IC. 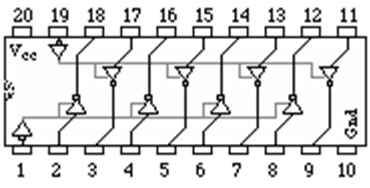 74HC240 is used as motor driver IC (Fig 7). Motor drivers are essentially current amplifiers. Their function is to take a low-current control signal, and turn it into a proportionally higher-current signal for driving a motor. Here the motor require 100's of mA to make it turn. For the 74HC240 each channel of motor driver power is provided by one or more inverter on the chip. One of these IC can provide 8 individual drives, up to about 35 mA per channel. These kind of neuron circuits usually have sensors that allow them to interact more fully with their environments. The circuits starts with 2 photo sensitive components. It can be photo diode or any light seeking components like LDR. We use LDR . The values of R2 and R3 are experimental and are related to the resistance of the photosensitive devices used in the circuit .R2 should be equal to the minimum resistance of the the LDR in bright light. If necesary these sensors should be masked so that the current through them is not too high in bright light to avoid power losses. R2 together with C2 limits the maximum frequency of the monocore and motor drivers when the light is bright and the sensors are equally lit. This further avoids power losses as switching losses increase with frequency and motors don't respond very well to high switching frequencies. R3 should be equal to the maximum resistance of the sensors in low light. R3 together with C2 sets the minimum frequency in the complete dark. The above light seeking circuit is set up in a box as shown in below figure (Fig 8). Light falling on the circuit can be controlled by the bulbs fixed near to the circuit. The two LDRs are covered by yellow mask. 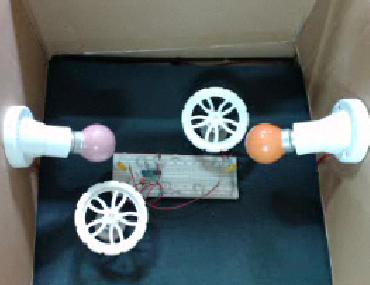 LDR1,which is connected in the left side of the circuit can be controlled by bulb1(Rose) and LDR2, which is connected in the right side of the circuit can be controlled by bulb2(Orange).Two wheels are connectd on the top of two motors to indicate the direction of rotation of motors. The input to the motor from the circuits according to the light present in the environ ments can be viewed from the two output graph .